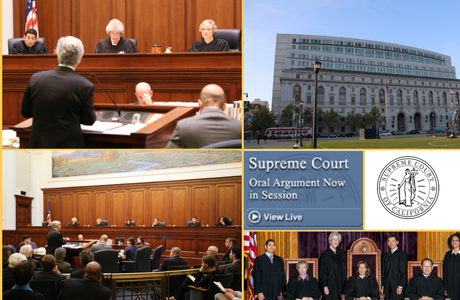 The following cases are placed upon the calendar of the Supreme Court for hearing at its courtroom in the Ronald M. George State Office Complex, Earl Warren Building, 350 McAllister Street, Fourth Floor, San Francisco, California, on May 30, 2017. #16-229 California Cannabis Coalition et al. v. City of Upland et al., S234148. (E063664; 245 Cal.App.4th 970; Superior Court of San Bernardino County; CIVDS1503985.) Petition for review after the Court of Appeal reversed the judgment in an action for administrative mandate. This case includes the following issue: Is a proposed initiative measure that would impose a tax subject to the requirement of California Constitution, article XIII C, section 2 that taxes “imposed by local government” be placed on the ballot at a general election? #16-219 Rubinstein (Latrice) v. Doe No. 1 et al., S234269. (D066722; 245 Cal.App.4th 1037; Superior Court of Imperial County; ECU08107.) Petition for review after the Court of Appeal reversed the judgment in a civil action. This case presents the following issues: (1) Does the delayed discovery rule in Code of Civil Procedure section 340.1 apply to the accrual of a cause of action against a public entity for purposes of determining the time within which a claim under the Government Claims Act must be made? (2) Does Government Code section 905, subdivision (m), apply to childhood sexual abuse causes of action based on conduct occurring before January 1, 2009? #14-40 F. P. v. Monier (Joseph), S216566. (C062329; 222 Cal.App.4th 1087; Superior Court of Sacramento County; 06AS00671.) Petition for review after the Court of Appeal affirmed the judgment in a civil action. The court limited review to the following issue: Is a trial court’s error in failing to issue a statement of decision upon a timely request reversible per se? #14-141 People v. Pennington (Bryan M.), S222227. (B249482; 229 Cal.App.4th 1376; Superior Court of Santa Barbara County; 1423213.) Petition for review after the Court of Appeal affirmed a judgment of conviction of criminal offenses. The court limited review to the following issue: Did the People prove that the named victim, a harbor patrol officer for the City of Santa Barbara Waterfront Department, is a peace officer within the meaning of Penal Code section 243, subdivision (b), supporting defendant’s conviction for battery on a peace officer?